Today we have a reminder post for the Our Daily Bread Designs “Shining the Light” ODBDSLC278 “Dots and Dashes” Challenge! 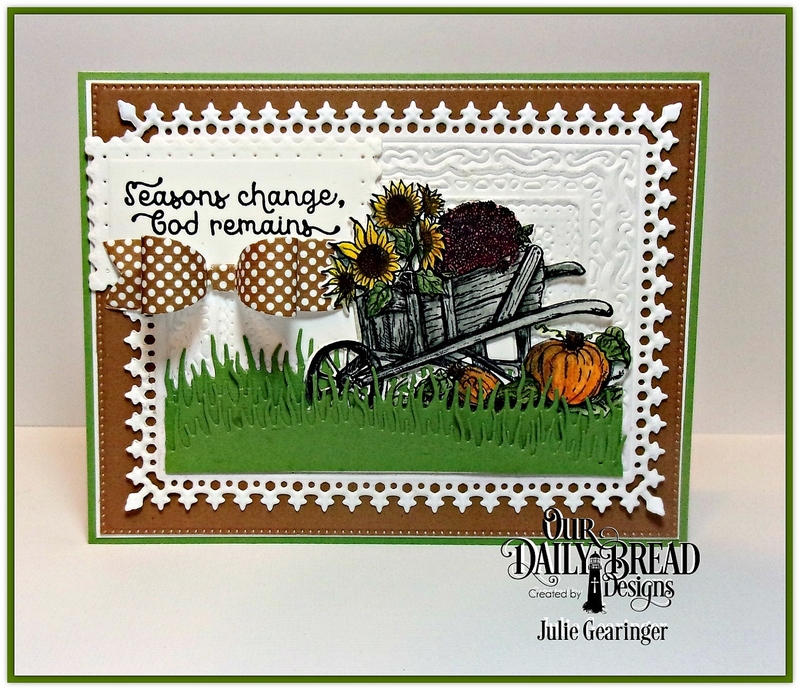 For this reminder post, I designed a card using the September 2016 OurDaily Bread Designs Release Stamp Set, Seasons Change along with the coordinating Wheelbarrow Die and the new Grass Lawn Die and Grass Hill Die (as well as other dies and paper from previous ODBD releases). I am also linking this card to the Word Art Wednesday #248-#249 "Anything Goes" Challenge and hope you will take the time to visit their site as well- fabulous inspiration from all! Die cut a piece of ODBD Ephemera Essentials 6x6 Paper Pad with the ODBD Pierced Rectangles Dies mount onto a piece of white cardstock, trim close to the die cut edge and mount into the pear card base. Using the ODBD Lavish Layers Die, die cut the frame of the die with white cardstock, keep the cardstock in the frame, position all of the remaining dies from the set into the frame and emboss the cardstock. Layer the embossed white panel onto the card front. Ink the ODBD Seasons Change sentiment with archival black ink and stamp onto a piece of white cardstock, die cut and emboss with the ODBD Filigree Frames Dies and adhere to the card front. Stamp the wheelbarrow image from the ODBD Seasons Change stamp set with archival black ink onto white cardstock, die cut and emboss the image with the ODBD Wheelbarrow Die. Color the wheelbarrow image with watercolor pencils and add shimmer with a clear glitter marker to the flowers. Die cut the Grass Hill Die and Grass Lawn Die from green cardstock and layer onto the card front. Die cut and emboss a piece of polka dot paper from the ODBD Ephemera Essentials 6x6 Paper Pad with the Small Bow Dies, assemble the bow and add to the card under the sentiment. Add the wheelbarrow die cut tucking under the grass a bit to finish off the card. You have until October 2nd to join us for a chance to be spotlighted for the Shining the Light award or to win a $15 ODBD gift certificate (one random participant will be chosen). To be spotlighted for the Shining the Light Award, you must use ODBD stamps (or stamps from our sister companies: North Coast Creations or Artistic Outpost). Thanks again for taking the time to stop by! We hope you will be able to join us for the ODBD Shining the Light ODBDSLC278 “Dots and Dashes” Challenge! Hugs and have a blessed week, my friends! oh i just love the wheelbarrow with the grasses, so cute and the little bow, OMGosh, so adorable!! This card is really sweet! Love it! I love the papers too, perfect! Amazing card my sweet friend! What a gorgeous card, Julie!! I just love your coloring of the wheelbarrow and the embossed background behind it as well as the layering of elegant dies!! The dotted bow is a beautiful and cute touch!! Gorgeous card my friend!! Have a blessed day and week my friend! I love your wheelbarrow scene and how you framed it! Beautiful! Such a beautiful card. Love that polka dot bow. Oh, Julie, this is a gorgeous scene with the wheelbarrow, and I agree with Chris about the beautiful embossing. Gorgeous coloring, and a beautiful card! Hugs, sweet friend! I love the sweet rustic wheel barrow, and the dies you have used create such lovely layers! So glad you were blessed with time to craft and that you chose to share at Word Art Wednesday. An absolutely gorgeous card. The dies, the coloring and the layering are well put together to create an awesome scene. We are so blessed of your joining our Challenge at Word Art Wednesday and hope you'll join us again in the new Challenge that started today. Leaving you with the encouragement from God's Word in 2 Timothy 2:10 which says, "For this reason I endure all things for the sake of those who are chosen, so that they also may obtain the salvation which is in Christ Jesus and with it eternal glory." Have a wonderful week.